In this third album from Grammy nominated ensemble Zofo, the critically acclaimed piano duo takes the listener on a metaphorical exploration of the galaxy with mesmerizing, outer space-themed duet works by four noted composers of the 20th and 21st centuries - Gustav Holst, George Crumb, David Lang and Urmas Sisask - performed on one piano, four hands. Since joining forces as a professional duo in 2009, Eva-Maria Zimmermann and Keisuke Nakagoshi - Zofo - have electrified audiences from Carnegie Hall to Osaka, Japan with their dazzling artistry and outside-the-box thematic programming for piano-four-hands. This prize winning Steinway Artist ensemble - one of only a handful of duos worldwide devoted exclusively to piano duets - is blazing a bold new path for piano-four-hands groups by focusing on 20th and 21st century repertoire and by commissioning new works from noted composers each year. Zofo�s debut album 'Mind Meld' (DSL92151), released by Sono Luminus in April 2012, received a 2013 Grammy Award nomination in the category of Best Chamber Music/Small Ensemble Performance. 'Mosh Pit' (DSL-92167), Zofo�s second release, put the duo�s considerable keyboard skills to the test in exciting, high energy, evocative dance-themed duets from an all American group of noted 20th century composers. 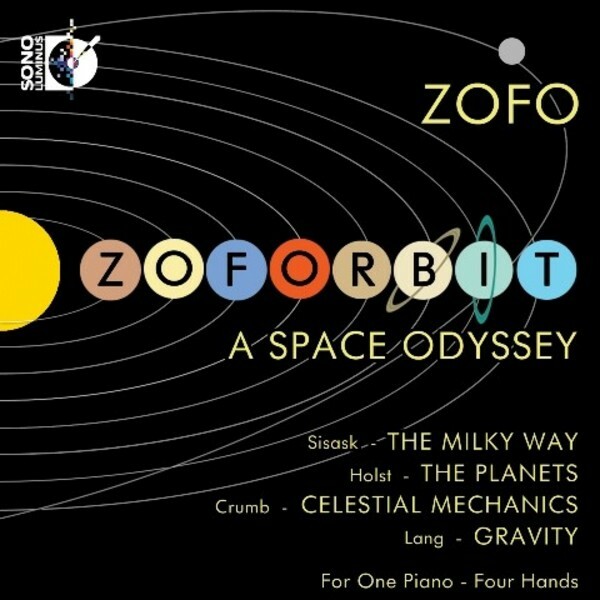 'Zoforbit', Zofo�s third album with Sono Luminus, takes the listener on an intragalactic voyage through the Milky Way, with musical visits to the planets of our solar system, to bright stars of the galaxy, and back again. Estonian composer Urmas Sisask sets the mood with the other-worldly sounds of his composition The Milky Way, featuring innovative inside and outside the piano techniques that evoke a sense of the cosmos. The journey continues with a tour of Gustav Holst�s The Planets, and visits to the stars Alpha Centauri and Beta Cygni as musically envisioned by George Crumb in his one-piano-four-hands masterpiece Celestial Mechanics (Makrokosmos IV). The space exploration concludes with David Lang�s Gravity, which metaphorically coaxes the listener back to earth in slow-moving patterns of descending notes. All is presented with stunning sonic clarity and colour on this Pure Audio Blu-ray release which includes a Blu-ray copy with high resolution surround sound and stereo versions, standard CD, and digital copies via mShuttle.